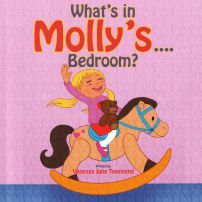 Vanessa Jane Townsend, children's book author from New Zealand, was inspired to create Molly's Bedtime Stories after being unable to find the types of books that she would like to read to her own daughter Molly. Her series of preschool age children's picture books have vibrant illustrations and easy to read story lines that use alliteration. They are designed to encourage easy learning through repetition of words beginning with the same letter & sounds. Children will enjoy following Molly on her everyday life adventures by learning about the creatures or objects that she discovers & interacts with along the way. All transactions are in New Zealand Dollars. Orders outside of New Zealand and Australia are FREIGHT FREE when purchasing the 'Full series' (Rest of the World orders). commented on "We are very proud to have donated over 200 books to Ronald McDonald Houses Nationwide and Starship Hospital last week. It was such ..."
commented on "Watch my interview to learn about the background of the series "
commented on "We are very pleased to receive this lovely review of What's in Molly's....Suitcase? completed by Kimberley aged 5 as part of the NZ ..."
Kid's Club Review - What's in Molly's....Suitcase? commented on "Open iTunes to buy and download the app for only $1.20USD. ..."
commented on "Enjoy cuddles and special time spent between you and your young child. ..."
Pre-register to be the first to know about future books being released in this series.